If you are in need of professional St Neots limo hire services, we will be able to cater to your luxury transportation needs in the most professional way. 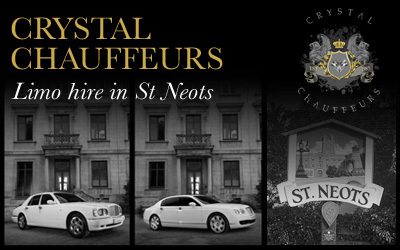 Crystal Chauffeurs is your trusted limo hire service provider in St Neots. We offer very reliable limo hire service that will meet all your needs in a very efficient way. We offer very friendly services without losing the professional touch for which our customers love us and keep coming back for all their subsequent requirements. We do not just claim to be the best Executive Limo Wedding Car Hire St Neots services but our long list of happy customers will vouch for the quality of our services and for the level of customer satisfaction that we give our customers. Our limo hire St Neots services are designed to help our customers get the best value for their money. You can now be driven around in top-class limousines in the UK like a celebrity. Our experienced chauffeurs will make you feel special. Let the high limo hire costs do not deter your any longer. Crystal Chauffeurs brings you outstanding limo hire services at the cheapest prices. Here are few good reasons why you should choose Crystal Chauffeurs for your limo hire needs. We come with several years of experience offering limo hire solutions. No requirements of yours will surprise us as we have seen and handled all types of limo hire requirements. So you can confidently talk to us about your special preferences and needs and we will not disappoint you. We have a wide range of limos for you to choose. No two customers walks in with the same requirements. We are here to help you, don’t worry, regardless of your limo hire needs we have the right type of vehicle for your requirements. We have special range of limousines for wedding transportation needs, VIP corporate travel needs, sightseeing, airport transfers and for every other need of yours. You just need to name your needs and the rest will be taken care by us. Top-class chauffeurs to ensure exceptional services. We screen our chauffeurs very carefully, all of them are fully licensed to drive chauffeur driven vehicles. Our chauffeurs are very polite and friendly. You will never run into issues with our courteous chauffeurs. Well maintained limos that make our service highly reliable. All the vehicles are regularly checked to ensure the highest level of safety and comfort. Our limos are very tastefully furnished and you will be able to enjoy a luxurious ride in our limousines. Our prices are very affordable. We keep our tariffs transparent and you will not have to worry about any hidden charges whatsoever. We will provide you with a written quote for your requirements. We tailor our limo hire solutions to match your requirements and we never force our rigid packages on to you. Hiring a limo is now a very enjoyable and completely hassle free process. No matter what your Executive Limo Wedding Car Hire St Neots requirements are we guarantee 100% satisfaction.